D.M. (Cardiology) , M.D. (General Medicine) , M.B.B.S. Dr Praveen Chandra is one of the best cardiologists in Haryana. Dr. Praveen Chandra is proficient in a lot of new devices and the latest technologies. Dr Praveen Chandra is a fellow of Endovascular Intervention Society of India and the Asia-Pacific Society of Interventional Cardiology. Dr Praveen Chandra was also the key organizer and director of the AMI course in New Delhi for 2005, 2006, 2008 & 2010 and is an author to over 100 articles and reviews in leading medical journals. Dr. Praveen Chandra is one of the best cardiologists in Haryana with an experience of 32 years. 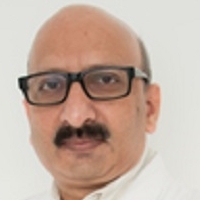 Dr Praveen Chandra is a Fellow of Endovascular Intervention Society of India and the Asia-Pacific Society of Interventional Cardiology, Dr Praveen Chandra is a Fellow of American College of Cardiology. Dr Praveen Chandra is a Fellow of European Society of Cardiology. Dr Praveen Chandra is a Fellow of Endovascular Intervention Society of India, Asia Pacific Society of Cardiology. Dr Praveen Chandra is a Member of Cardiology Society of India.